I have a story for you, and a fiercely opinionated rant. Read at your own risk. Please feel free to comment. One of my homeschooled kids is a braille reader. First of all, let me remind everyone that the LAW states that Abi is entitled to an accessible test equivalent to what her sighted peers take. The school promised to provide a test in Braille. So far, so good, right? The Braille test was sent to the test proctor who panicked and sent it back. Then, the test was sent to Abi's braille teacher who was off work for [totally legit] personal reasons. Bad timing. Not his fault. When he got back, he still hadn't received the darn thing, even though the rest of us had long ago taken the test. He finally got it and administered it to Abi, but the Braille test was created by a computer translator in "correct" grade 2 Braille and presumable prepared by someone who either doesn't read Braille or doesn't teach Braille to Kindergartners. The Braille teacher has seen this before, and warned me that Abi would certainly fail the test completely, and that is exactly what happened, even though she is on grade level in her reading ability. So, of course, because of that, she was identified as needing remedial reading help, which would take place on the computer she can't see using the screen reader we don't have yet, with words that fit the sighted kids' curriculum, but not the Braille one. There are special symbols in front of each letter that a beginning reader could not be expected to figure out! Not only that, but Tier 2 is geared toward sighted readers and is not aligned with the Braille teaching curriculum, so it would be more confusing than helpful. Very much hoping this can be sorted out quickly so the Tier 2 people don't bug us for weeks, as has happened with another of my students who was not supposed to be in Tier 2 but was somehow entered into the system as such. The teachers nicely replied back that it would be taken care of. They would ignore her test. Throw it out. Great. What message does this send to my daughter? Okay, can I rant for a minute? In spite of the law clearly stating that a blind learner can and should be expected to take an accommodated test, the reality is that we're back to the same old attitudes of "You don't really matter. Sit in the back of the classroom and be quiet, while the kids who really do matter get on with the business of learning. You are not worth taking the effort to get this right." Also, on a slightly similar topic, would people PLEASE PLEASE PLEASE quit telling Abi that Braille is hard and that it's okay if she can't read it very well!!!! You know what? Reading all that squiggly print is hard too, but EVERY SINGLE child is expected to be able to do it. And they do. The ones who struggle get extra work, but they don't get excused and allowed to be illiterate! Reading Braille takes work, yes. So does all education. But it is NOT HARD! I should know. I taught myself how to do it. It doesn't take extra special sensitive fingers. It is not way, way harder. 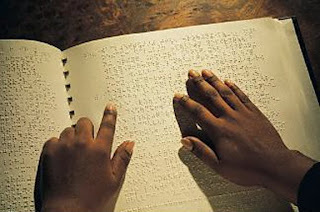 The Braille teacher says that every blind kid he's taught reads less well than their sighted peers. Well, with him and their parents and teachers (who all DON'T read Braille by touch, by the way) telling them it's hard, guess what? They will believe it! And they'll be lazy and learn less because they can. They are expected and allowed to learn less. I suppose if I did NOT read Arabic (which I don't) but I was supposed to teach a bunch of little kids how to read Arabic anyway using a cheat sheet card, I'd probably do okay. I'd also probably instill in them the notion that reading is really hard, so hard that I myself have never bothered to learn to do it. I'm not bashing Abi's Braille teacher. He is wonderful, and does a fabulous job with her EXCEPT when he tells her that feeling the Braille letters is hard to do and that she is okay if she can't do it. Rubbish. She can do it just fine. In an ideal world, Abi would have a test with just the letters on it, like she learned. She would get to take it in a quiet, proctored room like the other kids did, instead of in our house with whatever distractions our five homeschoolers, four pets and the phone can offer. She would have a chance to show, just like the other kids, that she can read and learn and is smart. She would be sent the message that her scores matter too. She would be taught that the fact that she is learning to read is important. Once again, society's attitudes, and social barriers are the only disabling condition. Blindness is a nuisance, but society's expectations are a disability. Blindness can't be changed, but society's expectations CAN and SHOULD be changed. Oh my....what crap!! I can't believe you are dealing with this. Hugs to you and Abi!! I'm sorry you're dealing with this. On the other hand, I believe ever so strongly that scores really don't matter, and the less value given to them the better. I would have just laughed and told the kids that we'd lucked out on that one, and wondered aloud whether there was any way we could get everyone else's scores thrown out too. Yes, there is that. Equality would certainly be obtained by tossing everyone's scores into the black hole that received Abi's test. I am also the parent of a blind child and have equal frustrations with the school system. My son is 6 and the school thought it was ok to read his math tests to him instead of having all materials brailled so he is able to read it himself. I have had several meetings with his teachers also administrators from our parish and things have improved. Never give up, never stop fighting for your child's right for an equal education and expectations, because I won't you are not alone. As parents we can encourage our children to work hard and do their best and they will be able to do anything they want no matter what anyone else says. Thank you so much for sharing your story! I am a proud American, but I am often taken aback and shocked beyond words at the attitude toward nonvisual skills in this country! We are the LAST English-speaking nation to adopt Unified English Braille. At every turn, you have school administrators who discourage TVI's from declaring that students with any amount of residual vision, no matter how meager and inadequate this might be, that students need to learn Braille. The kids who have no functional vision are taught Braille, but the ones responsible for the instruction also come into it with a biased attitude, accept slower reading rates of kids, and make excuses for it rather than really learning the code themselves and expecting the kid to perform on grade level. Tons of money are thrown into expensive magnification devices that are a fickle anomaly to use at best and for creating technologies that provide only audio feedback, which could be spent getting materials and technologies that would make more things available in Braille. The only hope for changing these attitudes is for people like you and me to keep sharing our stories, using Braille effectively in public so that people will start to understand that it works, and by contacting our legislators, lawmakers, and school officials in our community to let them know how we feel. It won't be an easy task undoing all the madness and misconceptions that have been borne into the minds of the sighted concerning blindness, but I think we can start to turn the tides.